Chinese chicken stir-fry recipe designed to comply with the Whole30 diet program. A quick and healthy one-pan meal cooked in a wok. Each serving is packed with lean protein and fresh vegetables tossed in a delicious sauce. I grew up eating a bountiful amount of Chinese food, so it’s in my comfort zone to create simple weeknight recipes. To revamp a classic chicken stir-fry that complies with the Whole30 diet program, the sauce used has a few healthy substitutions like coconut aminos and arrowroot powder. The ingredient swap adds a rich flavor and a nice texture to the sauce without compromising the taste. Each bowl is packed with tender slices of lean chicken breast and fresh vegetables for a nutritious meal made with ease! So if you’ve got a wok, let’s get it fired up! Don’t have a wok? That’s okay! A large saute pan will also do the trick. What’s great about the stir-fry technique is that very little oil is needed to cook the ingredients, making it a healthier meal. The very hot pan rapidly browns the surface of the chicken, creating a beautiful golden color while adding layers of new flavors from the Maillard reaction. The hot temperatures cook the proteins in less than 5 minutes, while the broccoli, mushrooms, carrots and bell pepper just needs a quick sear. When cooking vegetables in the wok, it’s important to cook them until they soften while preserving the crisp texture and vibrant color. From the moment the chicken hits the pan, it only takes about 10 minutes to cook the entire recipe. It’s extremely quick and easy, just how weeknight meals should be! The stir-fry sauce is a little different in that the traditional ingredients, soy sauce, and cornstarch, are swapped for some more “modern” ingredients. I’ve been really curious about the Whole30 diet as a way to reset metabolism and improve gut health from a nutritional standpoint. 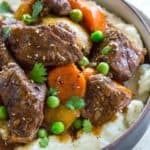 I wanted to challenge myself to create a sauce that could be compliant with the rules, but still, have all of the qualities in a good glaze- umami taste balanced with pungent and aromatic flavors. Chinese food is bold, so let’s keep it that way! Coconut aminos is used for soy sauce in the recipe. It’s a dark brown colored sauce made from coconut sap with savory and sweet flavor. It makes for a great wheat and soy free alternative in Asian cooking. I found that it’s much sweeter and not as salty as soy sauce. Arrowroot powder is used instead of cornstarch, which is a white fine powder that functions to thicken sauces. It adds a nice body to the sauce and allows the glaze to stick on the surface of the chicken. 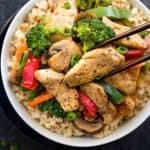 I like to serve this chicken stir-fry over a bed of sauteed cauliflower rice for a low carb meal. Grab some chopsticks and let’s dig in! I’d love to hear your thoughts on using the coconut aminos in cooking and if you have tried the Whole30 diet. Drop a note in the comments section below! Making cornstarch slurries to thicken stir-fry sauce is essential in Chinese cooking. Arrowroot powder made from the tuber of the arrowroot plant has become a popular substitute if you’re looking to eliminate corn from your diet. It can be used as a 100% replacement for cornstarch and works very similarly once heated. Arrowroot powder should be mixed into cool liquid before adding to the hot pan to prevent clumping. It should also be added to simmering liquid at 185-206°F (85-96°C) at the very end of cooking, and not reheated as it loses its thickening power with more heat. In a medium-sized bowl combine sliced chicken, 2 tablespoons coconut aminos, 1/2 teaspoon sesame oil and 1 teaspoon ginger. Allow to marinate for 15 minutes. In a small bowl whisk together 2 teaspoons sesame oil, 6 tablespoons coconut aminos, rice vinegar, salt, and arrowroot powder. Set aside. Heat a wok or large skillet over high heat. Add 1 tablespoon coconut oil and 1 teaspoon sesame oil, once hot add the chicken in a single layer. Allow to cook until browned, 3 minutes. Flip and saute until no longer pink, about 2 minutes. Transfer to a clean plate. Carefully wipe the inside of the pan with a paper towel. Add 1 tablespoon coconut oil to the wok, once hot and the broccoli and stir-fry for 1 minute. Add carrots and stir fry for 1 minute. Add mushrooms and saute for 1 minute. Add bell peppers and saute for 1 minute. Add garlic and ginger to the pan, stir-fry until fragrant, about 30 seconds. Add chicken back to the pan and stir to combine. Whisk sauce and then add to the center of the wok. Stirring continously until the sauce has thickened, about 1 minute. Season the chicken stir-fry with salt and pepper as desired. Garnish with green onions. Vegetable oil, olive oil, or ghee can be substituted for coconut oil. Cornstarch can be substituted for arrowroot powder if not complying with Whole30 diet. Soy sauce can be substituted for coconut aminos if not on the Whole30 diet, however, taste sauce first before adding additional salt. By the way we had that wok you have the link to and it is very nice. I’m sending it to our son as it is now too big for the two of us and we got the smaller sized All Clad which is also super nice. Thank you for your feedback Judy! Your son should have fun cooking with the wok! Jessica, that wok recipe sounds delicious ???? It will go in my shopping list for this week. Thank you very much. You’re welcome Cindy! Please let me know how it turns out! Is it possible to use something like coconut or almond flour instead of arrowroot powder? Hi JP! I think you can try to use coconut flour. I would whisk 2 teaspoons of coconut flour with 2 teaspoons water to make a slurry. Add that in after the sauce warms, and then whisk in to combine. You make need to add more if you want the sauce thicker. Let me know how it goes! Modified it a little as I cooked some salmon separately and didn’t do the chicken. I also added some Bell peppers and leeks and used shallots instead of garlic (can’t use garlic). Love coconut aminos and arrowroot! Thanks so much! Hi! You didn’t actually include the carrots in the directions. I’m making it now and I’m gonna throw them in with with the broccoli. Cross your fingers! Made this tonight using W30 ingredients. It was fabulous! Thinking of adding in some other veggies! 🙂 Thanks for the recipe!